Ski touring is essentially skiing without the lifts! It may sound like hard work but it is a great way to explore a mountain range in the winter otherwise not reachable through the ski lift system. ‘Skins’ are attached to the bottom of the skis which can grip the snow so that you can walk up steep terrain on your skis. Originally made from seal skin but now made of nylon, they allow you to glide uphill but not slip back downhill. Snowboarders can also join in by using a split board that separates for the walking phase with the ‘skins,’ and then the board can then be reattached to go downhill. The aforementioned ‘skins’ are vital as they allow you to go uphill. You will also need skis with touring bindings, ski touring boots, an avalanche transceiver, shovel, and avalanche probe. The right kit is essential and is expensive however if you are new to ski touring you will go with a mountain guide who should be able to rent you the correct equipment. The main difference from regular ski bindings is that ski touring bindings allow your heel to clip in and out. When you are walking uphill your heel will not be fixed into the binding, but when you go downhill you can change the settings to clip back in (although telemarking skis allow you to ski downhill without your heel remaining rigid for the descent). Both ski touring bindings and boots tend to be lighter than the regular ski equivalents to accommodate for the amount of walking. It is easier to walk with lighter equipment however regular ski boots and bindings offer more stability when skiing. How good a skier / snowboarder do I need to be? The scope for ski touring is endless – you can cover hugely difficult terrain or very easy terrain and the ability level varies accordingly. 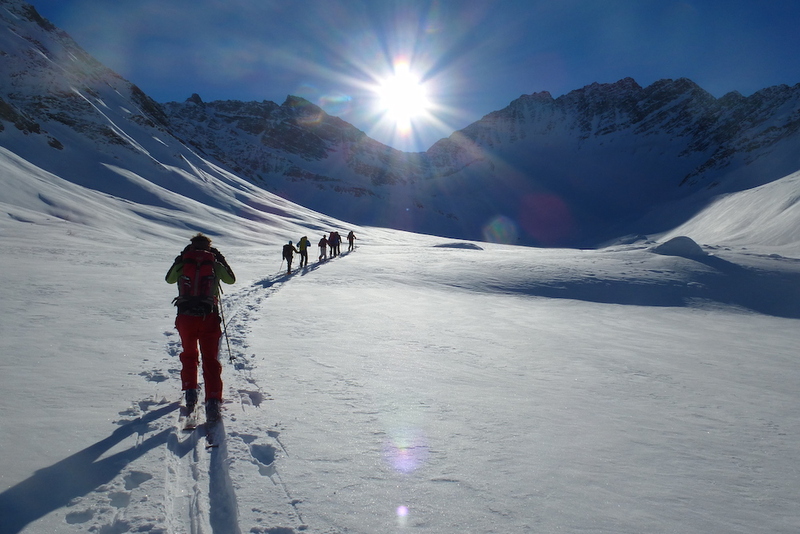 The most important thing when starting out is to go with a fully qualified mountain guide. Experience of off-piste skiing is important before starting out however you do not need to be an expert. The Tasty Ski Company has chalets in the Portes du Soleil ski area (Morzine) and Le Grand Massif ski area (Samoens and Morillon). There are a number of qualified mountain guides who we recommend. Click here for more details of Morzine ski schools and click here for more details of Samoens and Morillon ski schools. What types of tours can I do? The best part of ski touring is the freedom it offers you. You are no longer restricted by lift opening times and where they take you. The mountains are well and truly your oyster! It is possible to go on day tours or even little adventures that last a few hours. If you are doing a short tour then it can be a good idea to use the lift system to take you to the furthest possible point and then put on your skins from there. For more experienced ski tourers there is a network of mountain refuges in both the Portes du Soleil and Le Grand Massif. The refuges allow you to stay the night at altitude as part of your tour. You will be served a hot meal in a nice warm location with some of the best mountain vistas in the world. It truly is a memorable experience and one that we highly recommend! Have you booked your ski or snowboard holiday for this winter season? We have a small amount of availability left in both Morzine and Le Grand Massif. Click here for prices and availability at our Morzine ski chalets and click here for prices and availability at our Grand Massif chalets.